Hello! It's Jenny! Honestly, I was hoping that I wouldn't have to write a blog, like last year in Jamaica; however, here this is. This is sort of an update post for the past couple of days. Two days ago, we had a Summerfest at the House of Hope so we started off our day by sleeping in until eight o'clock. We got some dearly needed rest. Despite our work here not being physically exhausting on our bodies, like throwing concrete blocks in Jamaica, it's mentally and spiritually taxing to be immersed in a different culture, different language, and different experience, but still find connections and build relationships. This is even more wearing when you add social anxiety to a week entirely comprised of social settings. The Summerfest is basically a party the House of Hope hosts every summer with traditional Iranian food and is an opportunity for all the refugees to relax, eat, dance, and play. Some of the refugees brought food they made at home and Jenna, Eva and I made a killer salad loved by all. Most of the men helped grill kebab meats on skewers and seasoned tomatoes, while the women mostly talked or played with the children. I was helping with face painting, so three of the little boys wanted their face painted like Spider-man. Unfortunately, by the end of the party, all the little faces had been washed clean. Also at the very beginning of the day, the little girl stomped on my foot and broke off half my toe nail and it started bleeding, so I am now ever so slightly crippled. There was Iranian, Afghan, and Syrian music playing and some of the men started dancing and then all the kids joined in. The dancing looked like they were side stepping in a circle with their arms floating in the air, but it was way more graceful and elegant than this description depicts. After their beautiful dancing, we decided to show them some of our American culture, so we cranked up the cupid shuffle and Macarena and proceeded with the most ridiculous looking displays ever. During our devotions that evening, Hamid shared his testimony of coming to faith and his experience as a refuge from Iran, which was very powerful. The next day, we woke up way too early in the morning because we were leaving Linz. Before we left, though, a refugee man stopped by early to drop off presents for all of us. He gave us each a beautiful, leather id case/coin purse. I am sure he could have sold them for a lot of money, but he chose to give them to us. Our first stop that day was at the Mauthausen concentration camp. I am an extremely emotionally person, so I went into the day know I would be crying. Nothing can prepare you for the actuality of the atrocities. There were "death stairs" leading down to a quarry where they used the victims as slave workers and Nazis would push them down the stairs and off the cliffs for fun. There were sketches drawn by people showing them as emaciated to the point of skin and bones. We went through the gas chamber and where the bodies were cremated, and after all of this time, you can still smell death. I'm glad I wasn't hungry for breakfast, because I would have thrown it up. None of my words are even doing justice to it. It was horrifying. Switching to a lighter note, we drove to Salzburg and barely made it in time for the Sound of Music tour. It actually left four minutes earlier but came back for us. Thanks to my mom who raised me watching “Chitty, Chitty Bang, Bang,” “Mary Poppins,” and “The Sound of Music,” I was ecstatic. I had purposefully worn an outfit like Maria's, and my hair coincidentally looks just like hers. It was a four-hour tour, but I consider it entirely worth it, for the opportunity to run in a field of flowers, “blumen,” as they are called in German, singing, "THE HILLS ARE ALIVE WITH THE SOUND OF MUSIC, AHHHHHHHH," and twirl around with the alps as a backdrop. Hopefully, there is a photo of that joyous occasion somewhere accessible to you. Then we drove back to Munich through the beautiful greenery and pouring rain and checked in at our hotel around nine at night. We were all famished so we went to the hotel restaurant for dinner but promptly left because of how stupidly expensive their water was, but they made up for it with these adorable tiny jam jars they had on the table at breakfast which I took multiples of! We finally got food from Vapiano, a delicious Italian chain we also had in Austria. By the time we finished devotions and discussed our events of the day, it was midnight and we were exhausted. We spent all day Saturday and Sunday exploring Munich and enjoying the culture and people of Germany. We ate good German food and went to the Neue Pinakothik museum where we saw Van Gogh’s “Sunflowers.” Monet’s “Waterlilies,” and works by Manet, Degas and many other incredible artists. We climbed to the top of St. Peter’s Tower where you can walk around and get a 360-degree view of the city. But you do have to climb 300 stairs in a tightly confined space to do it. The top was amazing, but getting up and down… not so much. We also went to the largest park in all of Europe, the English Gardens and saw guys surfing on a river that flows through the park. It was really cool. We flew out of Munich on Sunday evening and landed in Paris around 10:30 Sunday night. Drivers from the hotel picked us up at the airport and we paid them extra to take us by the Eiffel Tower on the way back to the hotel. We went around the Arc De Triomphe on our way there. The Eiffel Tower is beautiful. It was raining but it still sparkled and glowed lit up against the dark sky. We got a group picture and several individual ones before heading back to the hotel. The next morning, we met in the lobby at 7 to head out and find a good café for breakfast. We found one and ordered delicious cappuccinos and hot chocolates (which were hot milk with tiny pitchers of melted chocolate for us to pour and make our own!). We had real French croissants, eclairs, Belgium waffles and the best raspberry jam I have ever had. We then found a shop which had quiches, macaroons and hand-made chocolates. We had just enough time to run into the Louvre. Inside, we saw the “Winged Victory” statue, the “Mona Lisa,” and “Liberty Leading the People.” Next stop was the airport and then home. There were a lot of issues at the airport but since we made it home, no biggie. What a trip. Hi y'all! It's Isabella! Today, we went on a boat ride with refugees only to ride our bikes 12 kilometers back to Linz. We woke up at about 8:00 to eat breakfast and do our daily devotion/journal time. After that, we packed up our backpacks full of snacks and our water bottles so we could share with our refugee friends and left our vans for the town square. We reached the town square at about 9:40 so we could have time to shop on Main Street before we ate lunch at 11. While we did that, the lucky bus/van drivers got to drop off the vans at a small town outside of Linz where the bike route would end. We all met up at 12:30 to rent bikes. Some of the refugees own bikes so they met us at 1:30. The boat, which was supposed to come at 2:00, was late by an hour and got there at 3:00 causing a huge delay in all of our plans. 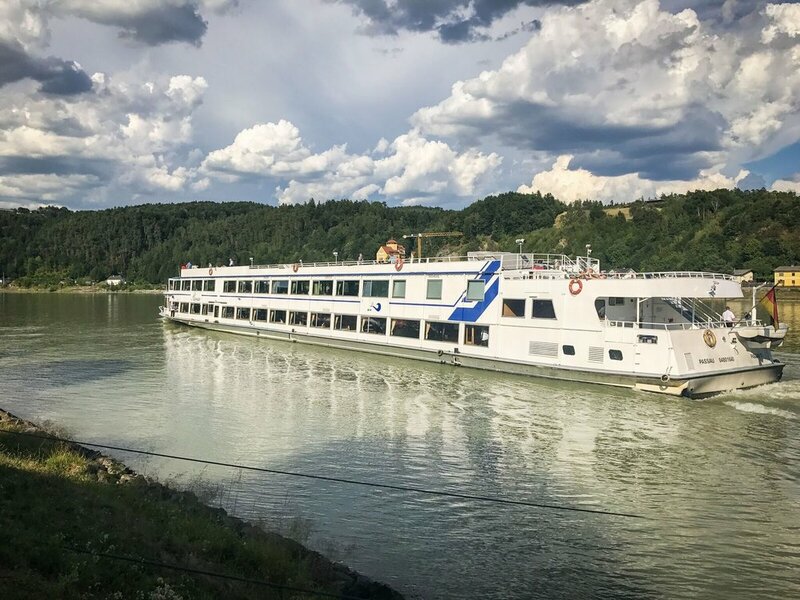 When it came, we all boarded with our bikes and watched beautiful scenery for two hours while we slowly went down the Danube. Many of our new friends had never been on a boat before. They loved it. When we got off the boat, a van was waiting to take back any people who could not bike. One guy's tire popped right before we got on the boat so he ran and bought a new tire when the boat docked. While he worked on his bike, the rest of us all got ice-cream. After that short break, we started our 12 kilometer journey back to Linz on bikes. Among us, riding bikes, were a man with a prosthetic leg, a man pulling his two daughters in a bike cart, and Bita, a grandmother with her son, grandchildren, daughter-in-law and husband. There were 52 of us including our 14 team members. 3 hours later, we made it to the small town outside of Linz where we had parked the vans. There, we played with the children, played cards with the teenagers, and talked to the adults for about an hour. By then it was 9:00 when the refugees went home in our vans, so we had to wait another hour before the vans could get to Linz, unload all the refugees, and come back to pick us up. Finally we made it back to the House of Hope at 10:00, only to get to bed at 12 because of showering and a late night dinner run to McDonald's. Today was tiring and long, but it was also filled with much laughter and learning. We learned that Bita, as an Afghani 13-year-old, was brought to her husband who was 23 and dropped off to be his wife. She said she sobbed for weeks. But you can tell how much they love each other now. He always offers her his arm when she is climbing, they hold hands while walking and sit and laugh together frequently. I am 14 and can't imagine being dropped off to be a wife!! We also learned that all but about 8 of the people who we have been hanging out with are still Muslim, including Bita. They are some of the most loving people we have ever met. Part of our jobs this week is to show them that Christians are loving, too and have a different hope and peace in our lives! Finally, we learned that one family came to Austria through being smuggled in on a boat. Most of the others were put into shipping crates and smuggled in through trucks. They were given sleeping pills so the anxiety of being enclosed in a box wouldn't make them freak out and get the smugglers caught. As you can imagine, it was very traumatic and not everyone survived. Most of the children were put in crates, too. Only the littlest babies were born here. These new friends of ours are survivors. they have endured a lot that i can't even imagine. It definitely makes all of us think twice before complaining and makes us so thankful for the homes we have and the God we serve. This is Grace Pietkiewicz, and right now I`m sitting on my bed with Isabella Kershner, Emma Hanson and Jenna Goodman eating Haribo gummies and simply relaxing, which is long needed after a long, tiring, but fulfilling day. The day started early for both me and Emma at 6:20 AM when we woke up for a nice run around the city. As soon as I stepped outside, however, I could already feel that today was going to be much hotter. And sure enough, it was. After a nice breakfast, we quickly began working. To start the day, we were given two simple assignments—first, we were told to repaint the white wall in the kitchen to cover up any scratches. Secondly, we moved several items out of the basement to check the walls for mold. We ended up sweeping and vacuuming the entire house along with the parking lot to clear gravel. We also washed outside windows and walls. 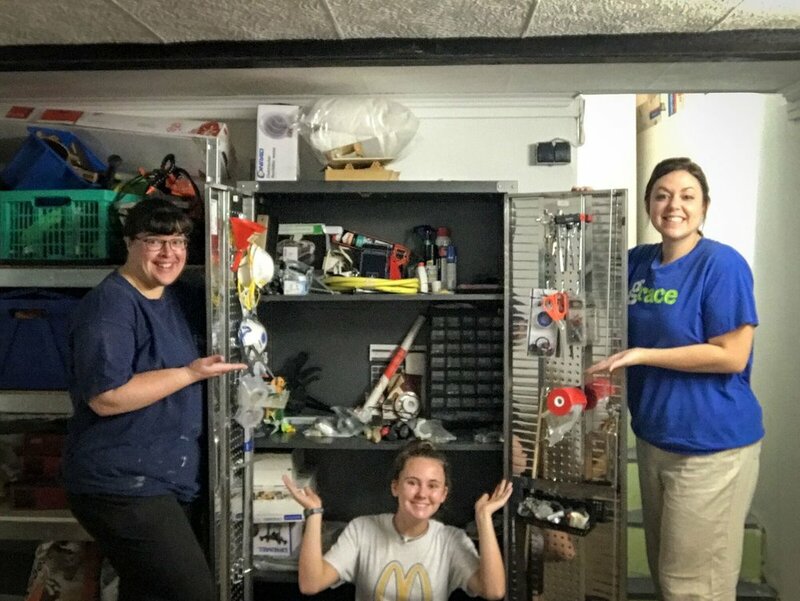 However, I think that everyone could say that we were able to turn two hours of cleaning into two hours of fun by playing music, laughing lots, and dancing randomly. One of my personal favorite parts was afterwards while we cleaned the paint off of some brushes and ended up completely soaked, partly by accident and partly on purpose :). After we finished cleaning, we had a quick lunch and then started to prepare for the House of Hope's International Cafe. The International Cafe basically runs from 2-5 (or 6 in our case, since everyone was having so much fun) and is a very relaxed event for refugees where tea, coffee and desserts are served, we play games, and everyone simply has good conversation in the presence of great friends. The first refugees showed up around 2:10, and than they steadily came in. I would say that around 30 refugees total attended. I personally sat outside and played with three adorable children. Jenna Goodman mainly was with Daniel (11 months) while Isabella and I (along with many others, including Jenny, Kate and Eva) played with Daniel`s brother Kasra (4) and a sweet 3 year old, Ida. Despite them either crying or screaming 5 times (and than forgetting why they were upset in less than 3 minutes), it was very fulfilling to be around the cute kids. Inside, there was also a lot going on. In the kitchen and rec room, many tables were set up with board games, a pool table, and decks of cards. Many of us were able to really get to know the refugee women (and men, for Dan and Peter) in a relaxed and comfortable setting. When the last people cleared out around 6:00, it was easy to say that everyone (except for maybe Kate Buxton) was exhausted after many non-stop days. We decided to stay in and order pizza and do an early devotional, where Dan gave us his testimony and taught us how to believe in God's plan for our future and trust that he has not forgotten or forsaken us. And that is where my reflection catches up with the present. To summarize the day, I would say that we are all exhausted. The days are jam-packed, and the close quarters can be challenging. Despite that, I am positive that we would all say today has been great. I think that being around the refugees, who yet having so little are so hopeful, is incredibly inspiring. Not to mention, I know that God is lending us some energy to just power through! We are all united in love for him, and it is so freeing. I hope you are having a fantastic day and feel God's overpowering love for you. I sure know that I do here! Hello, everyone back home! This is Clara, writing about our Monday! In the morning, we had the opportunity to sit in on a House of Hope (HoH) team meeting and see how the HoH operated. First though, Mrs. Schobesberger started off with Psalm 84 and focused on hearts set on a pilgrimage. Then, we were able to see the development and history of the actual house, which helped us see a little bit more into the vision that the team had for the house. Next, we got to learn a little more about the process for the refugees. First, they find any way that they can into the country, usually it is illegal. Then, they essentially turn themselves in and apply for asylum. Here's the cool part though, the Austrian government will place them somewhere and pay for housing and medical and even give them a small allowance to live off of. Although the government provides for them, the refugees are not allowed to work. That's where House of Hope comes in. House of Hope, in addition to aiding the refugees in assimilating into society through German lessons, sewing lessons and help with legal documents, they provide a space where the refugees can come and hang out and play games or make crafts. 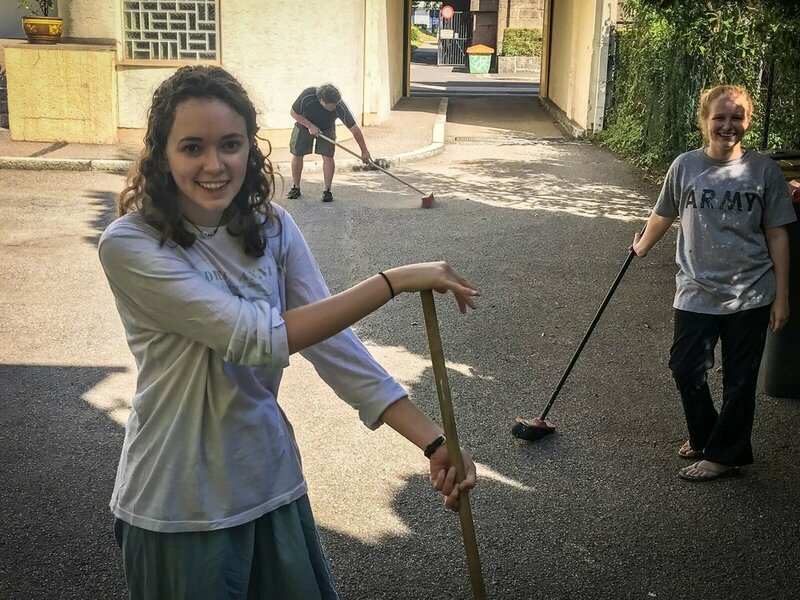 The Schobesbergers have said multiple times that their ministry is a ministry of presence, and that they are with the refugees and show God's love to them, and some of the refugees become interested in Christianity and then House of Hope offers a place where they can learn more about God. It's really cool. At the end of the meeting, we planned out the rest of our days here in Linz, but I don't want to spoil it for y'all! We are super excited! After the team meeting in the morning, we had the opportunity to change our original schedule around and drive to the Czech Republic! The whole team, including the House of Hope team, got to explore a beautiful old castle and a small city that surrounds it. There were a lot of tourists, but we ended up feeling more in place there than in Linz! It was really cool to see such an old, historic place, but also spend time with the whole team. Hanging out with Mr. Schobesberger is really cool, because he knows a lot of history, but also has a lot or stories from his family too, which are interesting and fun to hear! The whole HoH team is really great and friendly. We also got to try a really yummy Czech dessert, which is like a dough hollow tube, as wide as a mug, coated in cinnamon sugar on the outside and a coating of chocolate on the inside! It was so so so yummy. At night, we drove back to Linz, and ate at a traditional Austrian restaurant, which was really fun to try to the local food! We ended with a devotion from Peter about using faith to overcome fear and then we spent time with our family groups re-capping the day and sharing excitements, anxieties and prayers for the week. We are all worn out, but have enjoyed our day learning more about the ministry and getting to spend more time with the team! Thank you for your thoughts and prayers! Hi all! This is Eva KW writing our third blog about today, July 16th, 2017. Today started bright and early when the NAPC team began to trickle into the kitchen, rubbing our sleepy eyes and stifling yawns. The clock read 7:30 am by the time everyone had assembled around the kitchen table, hunched over our journals. The only sounds that filled the room was that of pen scratching on paper as we recorded the previous day's events, our feelings, any important thoughts. It is important to record what happened before another day's worth of memories push yesterday's to the back of our minds, where they are sure to be forgotten. Breakfast, as it has been every other day, was a bit of a chaotic event. Raspberry jam traveled up and down the table. Corn flakes were spilled around the bowls. There were never enough knives. And after a rushed clean up, everyone dashed to the rooms for just one last thing before we all piled in the van and wove our way through the narrow city streets before arriving at the church of Lisa, Werner and Debbie. If I'm going to be perfectly honest here, church was a bit confusing. We settled in, taking up almost the entire right side of the tiny 'chapel', and cast apologetic looks at the arriving churchgoers whose regular seats we had taken. Singing ensued, and there was a bit of a humour factor as we stumbled over the unfamiliar German words. It was as if our tongues had rejected the foreign sounds. The locals had the good grace not to laugh at us, and later, when we nodded off in the lull of the German sermon, they had the good grace to look away. Jessica, after church, confessed that she could not hold it against those who slept, because even she was experiencing the heavy-eyelid symptoms. After a quick dash home to grab a few supplies, we drove through the picturesque Austrian countryside to spend the day at the beautiful house of Lisa and Werner Schobesberger and their daughter, Sara, (and son, Ben, who is away at language camp). In true American spirit, we grilled hamburgers and sausages and snacked on handful after handful of potato chips. Werner's mother made us two different traditional German cakes which being the polite guests that we were, we ate pieces of both of! Hours were spent under an endless blue sky, talking, laughing, jumping on the trampoline, playing endless games of Deal Breaker ('deal breaker or not: he's perfect in every single aspect but he has a hard hat that he wears 24/7 that he refuses to take off. Do you go for it? '- courtesy of Clara). We lazily swung from their hammocks, played ping pong and listened to Herr Schobesberger's mother (Werner's mother) tell stories about surviving the Second World War. She is still a practicing Jew. Frau Schobesberger (Lisa) walked us through the journey of meeting, becoming pen pals and then dating Werner and then starting the House of Hope with their partners. At one point we received the good news that we would be able to visit the Czech Republic tomorrow (!!!!!). Finally, when the adults wanted some peace (or so I suspect), Werner led a short walk/hike through the Austrian countryside, where the pines reached so high that one had to crane their neck to see their tops and raspberry bushes lines the trail and a thick carpet of pine needles softened our heavy footsteps. We followed the path of a meandering stream before breaking off and walking by farm houses before finally completing the loop and arriving back at their house. Quality conversation ensued, and eventually, when Jessica sensed it was time to return to the House of Hope before we overstayed our visit, we presented our gracious hosts with gifts that reflected the south (pecans and honey and many other things). Then, there was the typical flurry of activity as everyone grabbed their backpacks and looked for their shoes and went to the bathroom just one last time before piling into the van. We finished the day with a devotion, worship, family time and prayer. Overall, it was a REALLY nice day and I am REALLY looking forward to going to the Czech Republic tomorrow! Hey y'all, it's Jenna! On Saturday, we had the opportunity to go hiking with the some of the refugees. However, our first stop was a candy shop! We found out that Linz has a Haribo shop (they make gummy candy for those of you who are healthy 😉), and it was awesome! We each took a bucket and filled it with all different types of gummies. We wished we could all read German though, because someone under 21 could have accidentally grabbed some with alcohol in them--- but Dan saved us from making that mistake! After the candy shop, we ate lunch and hopped in the vans to drive to the center of town. We met up with a group of the refugees in the town square, which is beautiful by the way! (Just an FYI, all the refugees' names have been changed for privacy!) Then we all started walking towards the hike, and the walk to the beginning of the hike was a hike itself! Our first stop was next to this amazing replica of the entire town of Linz, and it was really cool to look at! We gathered for a group picture and set off again. On the way up, we passed a church built in 799 (no, that's not a typo), and we all had to laugh about how America is such a young country, but none of us like to think so. On the way up from the church, we were able to play with a refugees' little girl, Zara. She was three, and a little shy at first, but she warmed up when I started to play with her. Grace (our only German speaker) taught me how to say "Wo ist Zara?" meaning "Where is Zara?" and she loved "hiding" behind doorways and fences and popping out! We got to the base of the hike and were so impressed to see two men carrying one of the women's strollers up the stairs! It was a tough hike, but when we made it to the top it was worth it! Zara's grandmother, Bita, loved to take selfies, so we took a bunch! She needed some help when the path got steep so Jessica and I offered our arms and the three of us laughed and hiked together. We didn't speak the same language but we didn't really need to. Then we all went to a tower to climb, which was a little bit scary because the steps were pretty unsupportive and some of them creaked a lot! When we made it to the top of that, we were stunned. To be on top of a tower on top of a mountain was breathtaking!! (I called it a mountain, but Lisa Schobesberger's daughter Sara, who grew up in the Alps, informed me that this was just a hill, haha!) We took lots of pictures at the top, and played with Zara's fidget spinner. She loved to have us make it go schnell, or fast! After we all came down the tower, we took a break on some benches, and started the walk down. We found a park along the path and all of the men immediately tried to out do each other on a swaying balance bridge. It was a lot of fun to see that no matter where you are or where you are from, boys will be boys. They clapped, laughed and encouraged each other but still each tried to be the best! On the way down, we found wildflowers, which Jenny made into a huge, beautiful bouquet! We also found wild blackberries, which Jessica was so thrilled about. She even found a massive stick to pull the bushes closer to her, and collected a lot to bring down to Bita and the rest of the refugees. The walk back to the town square was honestly exhausting, but for dinner we went to an amazing Italian place that the Schobesbergers recommended! We were struggling TONS on what the menu contained, and then someone found English menus and we were so happy! Although most people in Austria speak English (whether they choose to let on or not is another thing), menus are in German, so most of the time we just guess. We ended the day with some ice cream. Safe to say it was an awesome day!!!!! Hi! This is Emma on the second day (but first blog!!) of the Austria mission trip. Today was a long day, but very gratifying due to the relationships with both refugees and the Schobesbergers that were started. In the morning, Grace, Kate and I got up and did a nice run down to the Danube River (Jessica came, too, but didn't run the whole way--but we weren't alone!). We got back and did quiet times and journaling and then had a prayer breakfast with refugees. During this breakfast, we ate many delicious fresh bread products while listening to and praying about the needs and anxieties of the men there. We would have offered our own requests but after hearing their needs, ours didn't seem so pressing. After the breakfast, we finished orientation and hearing about the history and needs of the House of Hope (HoH). The guys went with the men to a gym for their weekly (apparently very serious/competitive) volleyball games and came back showing pictures of the men's uniforms and with stories of how this was not play but total work! 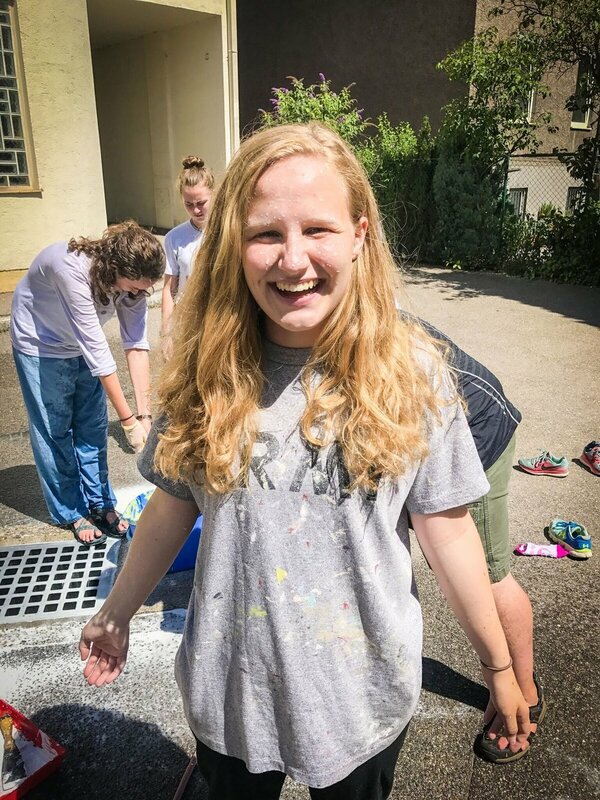 While they were "working," we helped clean out the kitchen at the HoH and afterwards, the female majority of our team sat in at the Women's Cafe while the two guys painted a wall outside. The Women's Cafe is a weekly meeting at the HoH where female refugees and a few of their small children meet together to socialize, do crafts and have tea and cake. Our team split between helping with childcare and making origami, decorating sunglasses and stringing beads. 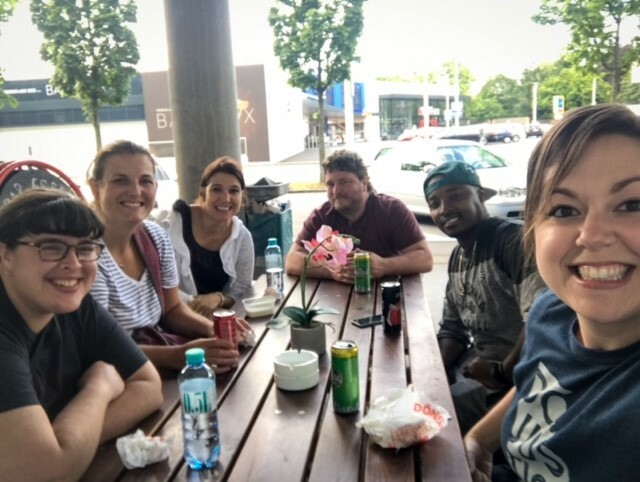 Once the Cafe was over, the team went to find dinner, and eventually found some delicious kebabs after trying and failing at several different places (including a shisha bar... whoops). We then had some mandatory (as dictated by us youth) gelato before going to Sara Schobesberger's youth group. They convene in a room very similar to the youth room upstairs, but were a much smaller group than ours (tonight at least) so we outnumbered them by far. This was problematic because only Sara is fluent in both English and German, and the leader was very limited in his English. He did enjoy putting specific people on the spot by giving them a difficult question and very little time to fully create an answer, which was very amusing for everyone in the room except for that person. Jessica asked if she should start using this technique and we unanimously said, "No!" When we got back, we did some worship and family time in small groups and then played a few games of nerts with the many, MANY decks of cards that various people brought. Overall, today was a great and fortuitous day that has made everyone even more excited about the upcoming week.